Elliptical vs. Treadmill: Which is Best? Welcome to the Health and Fitness Experts video series. I’m Francis, and today we’re going to talk about the elliptical vs. the treadmill and which one is better. Elliptical trainers and treadmills are two of the most popular exercise machines out there. They are very similar in many ways but there are some important differences. Both will give you a great cardio workout and both machines will burn about the same number of calories. But let’s take a quick look at some of the key differences. When you first get started an elliptical can feel a little bit strange. You can see that you move both your arms and your feet at the same time in opposite directions and both your feet and your arms move forwards and backwards. It can take a little time to get used to this coordinated movement. But most everyone gets used to it pretty quickly. And once they do, people find the elliptical trainer feels easier. Research studies have shown that the elliptical actually gives you the same workout intensity as a treadmill. But psychologically people feel that it’s easier. And you get a workout for both your lower and your upper body. A treadmill can also feel a bit strange. But it’s a very good simulation of walking or running outside, so it feels much more natural and people get used to it much more quickly. Unlike an elliptical, a treadmill only works your upper body. 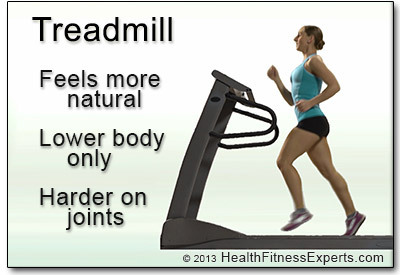 And since you’re pounding your feet running, a treadmill is also a little bit harder on your joints than an elliptical. So, should you choose a treadmill or elliptical trainer? Well that depends a little bit on your goals. If you’re training for a race, like a 5 or a 10k, then the treadmill is a better choice for you because it’s more like real running. But if you’re looking for more of a full body workout that’s also easier on your joints, then the elliptical trainer is a better choice. In the end, the best choice for you is the one that you’re most likely to use. If you’re a serious runner, then go with the treadmill. the elliptical trainer because it gives But otherwise I’d recommend you more of a full body workout and because most people find that it feels easier. Remember if you’re not motivated to use it, it doesn’t matter which one you choose. So pick the one that you’re most likely to use. That’s it for this episode. But you can find out more about ellipticals vs. treadmills on our Health and Fitness Experts website. You’ll also find tons of useful tips on diet, exercise, and nutrition that will help keep you healthy and fit. Thanks for watching, and we’ll see you next time! Treadmill vs. Elliptical Trainer? Both burn about the same calories. So the best one for YOU depends on your goals. Watch the video above or read the article below to help you decide. What’s best, an elliptical trainer or a treadmill? Both burn the same number of calories, so the best workout for YOU depends on your personal fitness and weight loss goals. Both machines will give you a great workout, but there are some important differences. In a nutshell, treadmills are a better simulation of real walking or running, while ellipticals feel easier. Ellipticals are also a little easier on your knees and joints. Let’s take a look at some of the details. 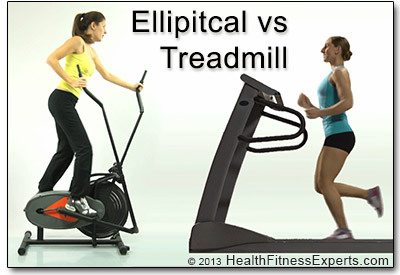 Elliptical vs. Treadmill? They are the two most popular exercise machines and either one will give you a great cardio workout. But depending on your specific needs and goals, one might be a better choice than the other. You are most interested in hiking or walking: you can save some money by buying a less expensive model. You are a serious runner or trying to become one: you’ll be able to log the miles you need, even when you can’t run outside. You are using it at home and have limited space: you could benefit from a folding treadmill. You need (or prefer) a low-impact workout that’s easier on your joints: an elliptical is lower impact. 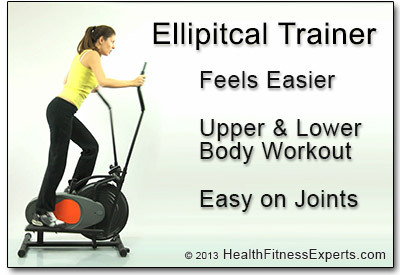 You want to include both an upper and lower body workout: an elliptical works more muscles. You think you’ll be more motivated because studies show an elliptical “feels easier” than a treadmill, even when you work out just as hard. Most modern treadmills and ellipticals share a set of similar features. Most models include an electronic console to set the length and intensity of your workout. A treadmill feels more natural. If you’re a runner (or want to be one), the treadmill is the better choice. Many consoles will track the distance you “travel” and calculate the calories you burn. Many models will also monitor your heart rate. Most also include pre-programmed workouts that vary the duration and intensity of exercise to target your specific fitness goals, such as weight loss, fat burning, or cardiovascular conditioning. Most models also include amenities such as cup holders and a stand or shelf to hold your magazine or book. With both ellipticals and treadmills, the features you get vary by manufacturer and price — more expensive models from better manufactures will have more bells and whistles than the lower priced models. Both elliptical trainers and treadmills make a great addition to your home gym. By enabling you to work out at home, they can really boost help you reach your fitness goals. While some people prefer the motivation of the gym, it’s certainly more convenient to be able to get a solid cardio workout at home. You don’t have to brave bad weather (too hot or too cold or too wet) to exercise outside or travel to the gym. And you never have to wait for someone else to finish their workout and free up a machine for you to use! The difference in the workout — full body for an elliptical vs. only lower body for a treadmill — may be a key reason for another difference: the Rate of Perceived Exertion. For most people who try both an elliptical trainer and a treadmill, they perceive that the elliptical provides a more effortless workout. They feel the workout is easier or less intense, even though they are actually burning the same number of calories. An elliptical feels easier, but it burns the same number of calories as a treadmill. Perhaps sharing the workload with your upper and lower body makes it feel easier. But whatever the reason, the “lower rate of perceived exertion” makes it feel easier and can motivate you to follow through on your workout. We’ve all heard about “no pain, no gain,” but “less pain, same gain” can be a good motivator. Although the elliptical machine simulates running or walking, it’s not actually either one. The treadmill is a much closer approximation of real walking, hiking and running. So if your goal is to get in shape for a 5k, you’ll certainly want the treadmill over the elliptical. Similarly, if you prefer walking or hiking and you are using the treadmill to replace that exercise during bad weather or challenging schedules, then you’ll want to stick with a treadmill. Another difference is that ellipticals give you a much lower-impact workout than treadmills. Treadmills do typically include some cushioning that limits the impact as compared to running outside on concrete or asphalt. But running on a treadmill is still a relatively high-impact activity, and it can be hard on your knees, shins, ankles, back, and joints. Ellipticals on the other hand were invented specifically to create a low-impact approximation of running. This difference has been born out in many studies. For example, researchers from that University of Mississippi found that ellipticals provide the same cardio workout as treadmills. But they found that ellipticals do it with a much lower impact and strain on joints. So an elliptical is a good choice if you are recovering from a running injury of if you have other conditions that could be negatively affected by a high-impact workout. You should note, however, that while the high-impact of the treadmill might be tough on your joints, such activities do help to promote better bone health and have been shown to help protect against osteoporosis. The elliptical trainer is a weight-bearing exercise, so it will also promote healthy bones much more than other cardio exercise such as swimming or biking. But the constant pounding of the treadmill will do it a bit better. If you are considering one of these machines for you home, you need to make sure you have space for it! They are big machines and can easily take up as much space as dining room table or a good sized sofa. If space is a problem, many treadmills fold when not in use. Of course, you’ll still need the full amount of space to work out. But when you are done, you can fold up the ramp and save some space. Ellipticals typically do not come in folding models. If noise is an issue, ellipticals are usually a little quieter than treadmills because they don’t have an electric motor. But the noise of either machine depends a lot on the manufacturer and the model. So you should try one out before you buy it and make sure the noise level is acceptable. There is a wide range of pricing for both treadmills and ellipticals. You can get cheap treadmills and cheap elliptical trainers, or you can spend a small fortune. But like you’ve heard before, you usually get what you pay for. Consumer Reports took a look at both elliptical machines and treadmills and found that you need to spend at least $2,000 to get a quality machine that will hold up to serious workouts. Cheaper machines feel flimsy and shaky and are much more prone to defects and breakdown. While these issues might be covered by warranties, you will likely waste a lot of time and energy tracking down the manufacturer and coordinating the repairs. And once the warranty expires, you are out of luck. Once you hit the $2,000 range, any quality treadmill or elliptical from a good manufacturer will serve you equally well. So price should not be a consideration when deciding between these two types of machines. The one exception is for walkers. If you plan to walk on your treadmill instead of running, then it’s OK to buy one of the cheaper treadmills. You won’t give it as much of a beating and the flimsy, shaky feel of lesser models will be minimized if you are only walking. Just make sure that you are happy to stick with walking. If you plan to start walking but then move up to running, you should get started with a better model that will work well for both activities. Choose the One You’ll Use! In the end, perhaps the most important factor in deciding on an elliptical vs a treadmill is thinking about which one will motivate you the most. Treadmill vs. elliptical? Both burn the same calories. So choose the one you’ll use. For non-runners, an elliptical is usually a better choice because it feels easier. The more you use it and the harder you work out, the better the results. If you work out equally hard on either machine, you’ll get the same fitness benefits. If you are a runner (or want to become one), you’ll probably prefer the treadmill. But otherwise, the elliptical may be a better choice because it feels easier and works both your lower and upper body. Remember, if you don’t go to the gym, or if your home gym elliptical or treadmill sits in the corner gathering dust, then it doesn’t matter which one you choose. So choose the one you’ll use! Do you prefer a treadmill or an elliptical trainer? Have you had a great (or bad) experience with one or the other? Leave a comment below and share your insights. Medicine and Science in Sports and Exercise. Exercise and Wellness Program. School of Nutrition and Health Promotion. Arizona State University, Phoenix. La Crosse, WI: University of Wisconsin. La Crosse Exercise and Health Program. University of Wisconsin at La Crosse. United States: American Society of Exercise Physiologists. Department of Exercise Science and Leisure Management, The University of Mississippi. I am going with treadmill because like you said, they are better at simulating real walking and since most of the time it’s freezing out where I live, it’s the best bet to shed some pounds this year. Thanks for the post! Great article, there is a real difference between them and it is important to get what is right for your workout. Francis thanks for sharing all this useful information and videos. I found myself getting bored on the treadmill so I decided to purchase an elliptical trainer and have seen tremendous results. Yes like you said it is a little tricky to get used to at first, but once you get the feel for it things are amazing. I am starting to reach my endurance and weight loss goals in a short period of time, and after my workouts on the elliptical I feel my like my upper and lower body have been totally drained. In my personal opinion I give the elliptical trainer an edge over the treadmill. Thanks for your insights, Dan! My first choice for a cardio workout is to run outside — weather and location permitting. But for an indoor workout, I also prefer the elliptical over the treadmill. I’ve always recommended elliptical trainers for their superb advantages over treadmills. You can easily lose a lot of weight and gain a smart physique with these machines.